It was on a trip to the States in 2014 for a festival at Firestone Walker that Bridge Road's Ben Kraus conceived yet another idea for educating the masses about craft beer. The man who has already launched IPA packs both in the form of IPAs packaged with an IPA glass and Hops packs featuring four different single Aussie hop IPAs* spotted variety packs on sale in the craft beer sections of supermarkets and figured he'd launch his own. The toughest part, he says, was deciding which beers to put in there. In the end he settled on his two biggest sellers – Golden Ale and Beechworth Pale – plus his Bling IPA and Hefe Weizen; four each of the first two, two each of the latter pair. He says the pack is aimed at people new to or having "their first dabble in craft beer." "I’m always encouraging people to taste a range of beers and explore new styles and other flavours," he says. "I decided to include the Bling in this pack as a step up in flavour from the pale and hopefully to get more people to fall in love with IPA, as I have. The inclusion of our Hefe Weizen was a hard decision; it’s a style that is often misunderstood and almost always forgotten. I learnt to brew making Hefe Weizen in Innsbruck, and I love drinking it whenever I go back. I guess, like with IPAs, I want people to get to know this style, and consider a Hefe next time they buy a beer." 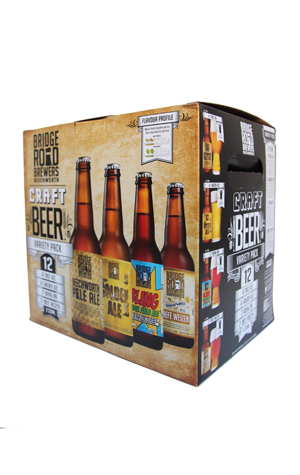 The beers come in typically eye-catching Bridge Road packaging complete with a bit about each beer and style, along with an explanation of the hop and malt scale that Ben first introduced to Australia a few years ago and which has since been appropriated elsewhere. *The 2015 single hops packs are also out, featuring Summer, Vic Secret, Galaxy and Ella IPAs.